Complexity of the landscape: the diversity of land uses and habitat types in a landscape. Simple landscapes are thought to be detrimental to pollinators due to a lack of basic resources such as food and nesting sites. Pesticide loadings: the amount of chemicals known to be harmful to bees. Competition between wild and managed pollinators. A large number of moveable, domestic honey bee hives in an area may mean that the honey bees compete with wild pollinators for scarce resources. To study these possible drivers we have designed a comprehensive site-selection process in order to find landscapes that relect contrasting mixes of land management and natural habitats. 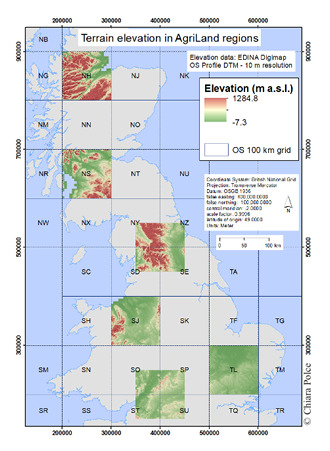 Firstly, 6 regions of Britian have been selected that are statistically representive of the British countryside as a whole based on a range of national datasets of features such as topography, land use cover, natural habitats and climate. These 6 regions are shown to the right. Within each of these regions, we have used computer modelling and national datasets to select 16 landscapes that reflect different mixes of land management and natural habitats, and differing conditions for pollinators based on the four potential drivers of pollinator change listed above. In total, we have selected 96 study sites, and by collecting detailed information of pollinator density and diversity, wildflowers and other factors we can understand how management and landscape features affect populations throughout Britain. With such a large number of field sites, the success of the project depends on the co-operation of hundreds of landowners and managers across the country. It is therefore important that we filter back much of the information we gather, and this is the broad focus of the third aim of the project.